If you are into birding...you may already know this information, however even some "birders" may not know the actual importance of what I am going to write about. eBird was launched in 2002, by Cornell Lab of Ornithology and National Audubon Society. This online portal allows birders, on any level, to contribute to science and the study of ornithology. Described as, "A real-time, online checklist program, eBird has revolutionized the way that the birding community reports and accesses information about birds." "A birder simply enters when, where, and how they went birding, then fills out a checklist of all the birds seen and heard during the outing. eBird provides various options for data gathering including point counts, transects, and area searches. Automated data quality filters developed by regional bird experts review all submissions before they enter the database. Local experts review unusual records that are flagged by the filters." It's really simple...by setting up an account and logging in, anyone can join in on the fun. For a bird addict like me, online data submission is a slippery slope. eBirding is so additive! 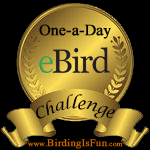 To me, here are the best eBird features: It's free!! It's easy to use. It's faster than a pad of paper or a spreadsheet. I'm able able to edit a list submission, if I forgot a species. Also, I can see how many "lifers" I've reported. Bottom line, if you care about birds and want to help...then eBird! Oh yeah, another really good tip! Thanks Pete.